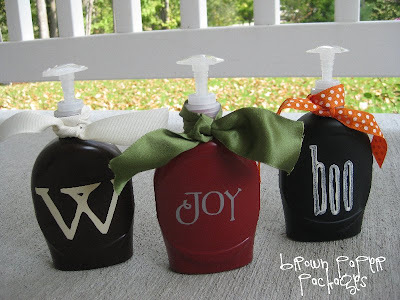 This is a simple, totally cute way to dress up any kind of hand soap or lotion! 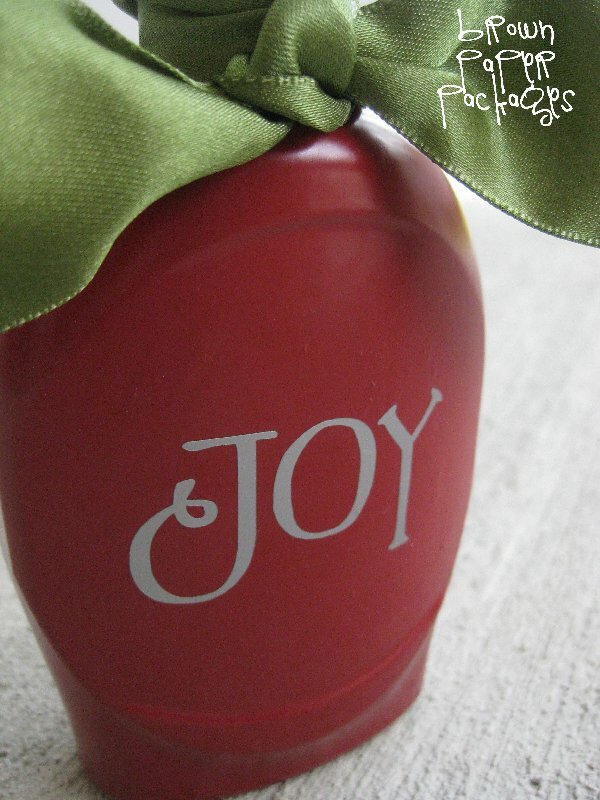 office gifts–or for your own! add the words “bath”, “kitchen”, etc. 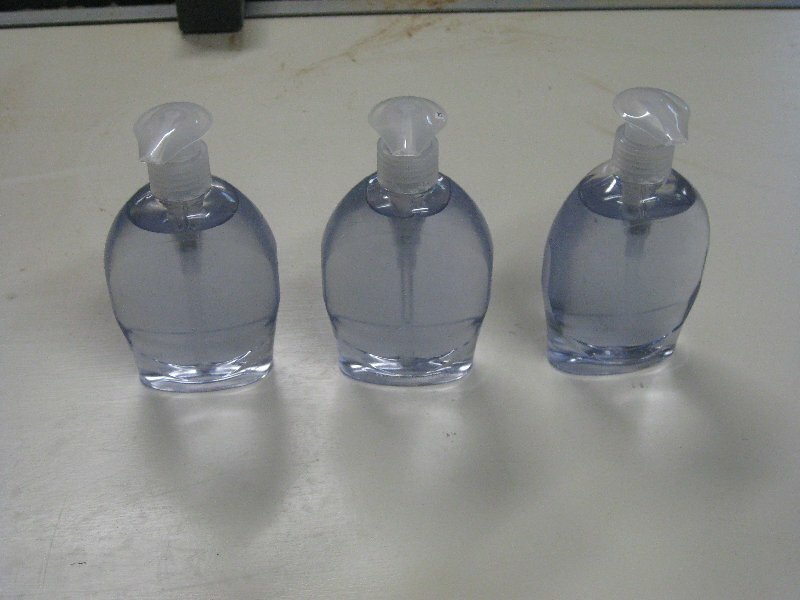 I just used very cheap (originally purple) hand soap that I found for about $1 each. That’s the beauty of this project–it doesn’t matter what the soap or lotion looks like, since it will be totally disguised when it’s finished. I made three different kinds–a spooky soap for Halloween, one for Christmas, and one with a monogram. I also switched up what I used for the text– I used vinyl on two of them, and paint on the other. I like both ways–they each have their own look, so you can decide which you like better. 1. Remove any labels, and excess “gooey” stuff from the outside of the soap. Goo Gone, or any adhesive remover should work well. Make sure the container is clean and dry. 2. Remove the lid/pump. 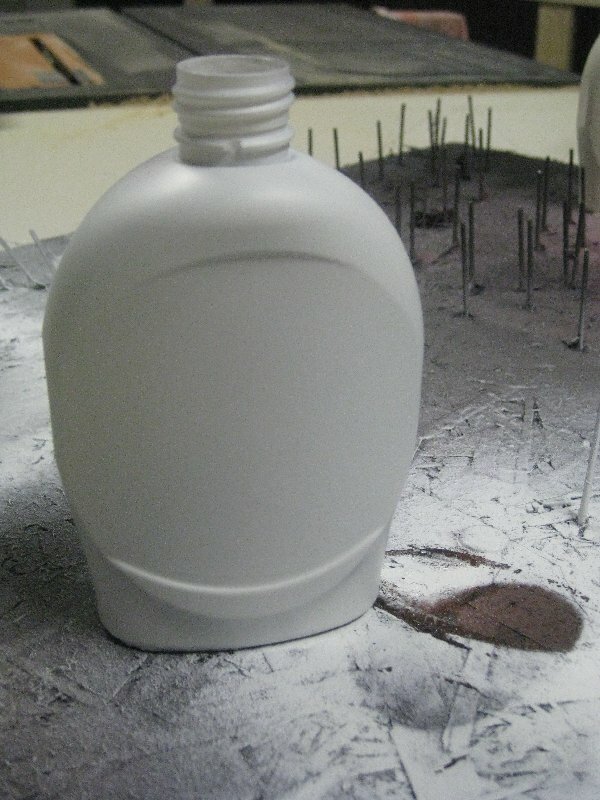 This step is IMPORTANT—you must prime the bottle BEFORE painting. If you don’t, the paint will run, or leave you with major streaks and bumps. I used a spray paint primer–I like Rustoleum–and sprayed it very lightly, just to cover. Let dry completely. *Note: One can of primer will last quite awhile. I made several, and still had a lot of paint left. 3. Next step…painting. When using spray paint, remember, less is more. Stand back a little more than you would if you were painting wood, and kind of let it mist over it. It will cover quickly, so you really don’t want too much. Let dry completely. 4. Now you’re ready for text! 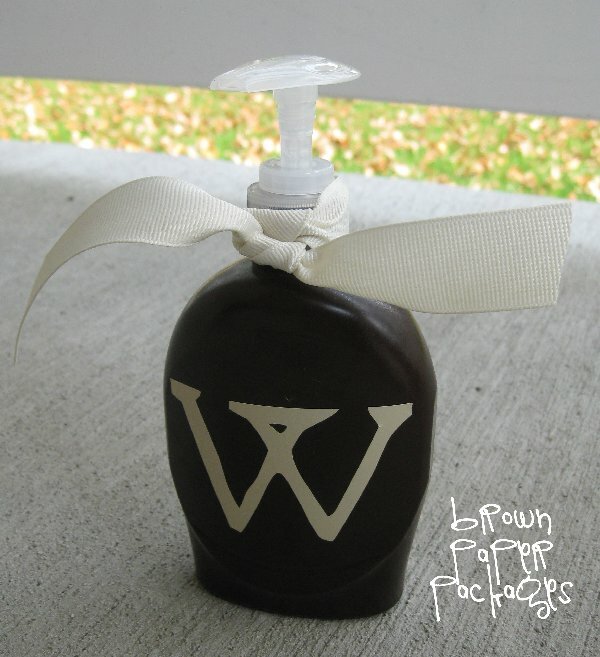 I rummaged through some extra vinyl I had, and chose a “w” for our monogram, and “joy” for a Christmas version. 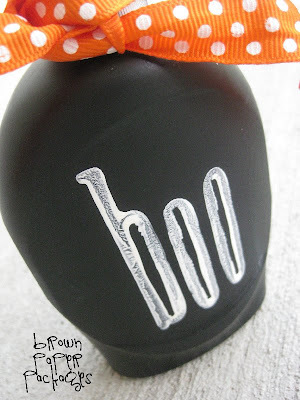 I also wanted to try using paint and my foam stamps for one, which I did for the Halloween version. If you’re using vinyl, apply as you normally would. If you’re using paint, you need to do one of two things–either use spray paint (just spray some paint onto a paper plate–not foam– and use your finger to apply it to the stamp), or you’ll need to spray the bottle with a moisture-resistant craft spray to protect the craft paint. If not, as soon as it gets wet, the paint will run. 5. Add your ribbon, and you’re done! Those are soooooo cute! I see Christmas gifts in the making! Very cute!! 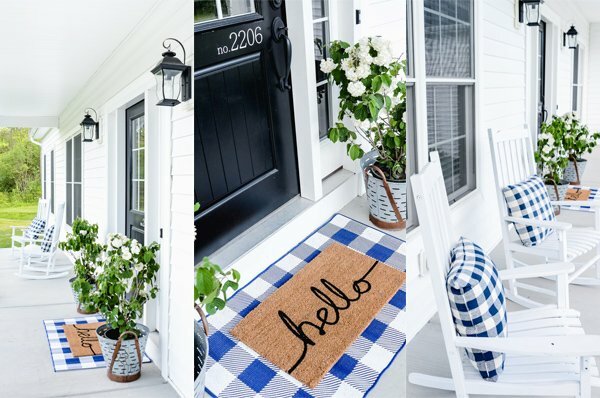 These would be a perfect "quick gift" for teachers, neighbors, anyone! Thanks for sharing!! Such a cute idea. I might have to try this. these are adorable! i'm going to have to make these for a friend for a housewarming gift! thank you for sharing – i look forward to seeing more of your ideas! 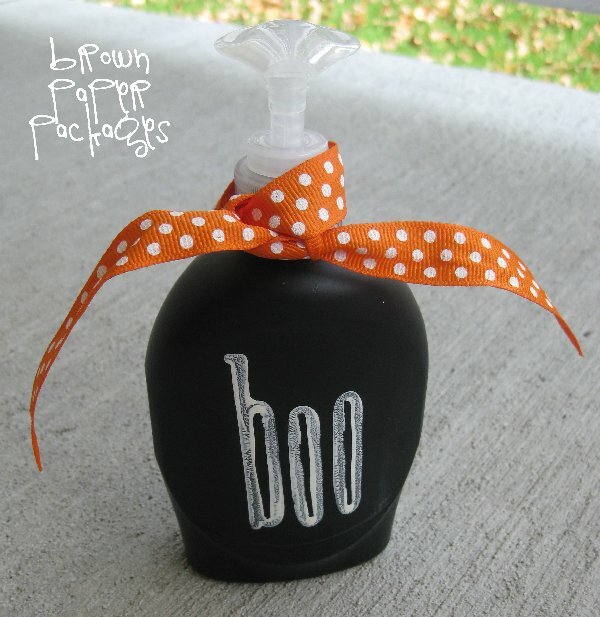 Super cute, inexpensive idea! Now I won't have to go and get the expensive soap dispensers at Bath & Body Works! I just wanted to let you know that I absolutely LOVE your blog! I just can't wait to see what you have on here everyday! I have made a few of your things, but just the simple ones:) Hey, a girls gotta start somewhere!! Keep them coming and thanks for all the ideas! You make everything look easy!! Great Idea!! Question for you…how did you spray paint with the soap in the bottles? And do you have a brand you prefer with the moisture resistant spray? I was just careful to always spray from the side, and never from the top. The soap isn't usually right to the top of the bottle–it's typically not even into the neck of the bottle, so it was totally fine. Let me go double check the name of my craft spray, and I'll be back! so cute! so the paint won't scratch off or anything? These will be great neighbor christmas gifts! I am sooo stealing this idea and there is nothing you can do about it!!! Can't wait to give it a try, thanks Darlin! Love your blog and can't wait to try some of your projects! Great idea! So simple and so cute! I love these! They would be perfect for so many different occasions, thanks for sharing! Oh these would be so fun to put in a guest bathroom, as a little gift! So, so clever! I would have never thought about decorating with spray paint! I have filed this at thecraftersfilebox.com. Thanks so much for sharing!! Seriously cute. I will be making these soon!! Thanks for such a clever and simple idea!! These are just too cute! I have some dispenser I will have to try this with. That's another, "Why didn't I think of that?!" projects. Brilliant! LOVE this! So dang cute and inexpensive. I just got married and want to make our little place cute but have to watch out on the spending part. I can't wait to start and make some for our home and gifts! Such a great idea!! I love you blog! Thanks for sharing all your creations with us. This is a life-saver craft for my old-house bathroom! 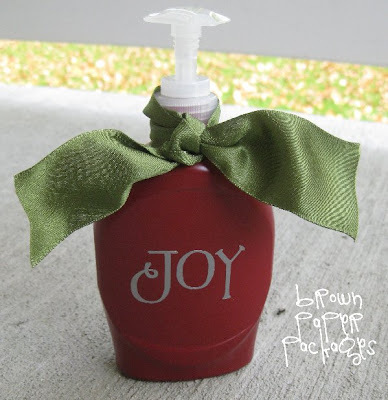 I hate plastic soap bottles, and love to find thrifty AND cute ways to dress it up. This is so perfect! I already have the right color spray paint and ribbons on hand. I'll just need the primer. I'll have this done in no time. Thanks! Oh my gosh, I love these!! Great idea!! Brandi–It's a flat black spray paint. I waited a couple of hours in between primer and paint, but it only needed one coat of paint. Just found this on Pinterest.